To start with, for those of you who may not know, shorthand is a means of rapid writing. It's main use was in business offices around the world. From approximately the 1850s throught the 1980s, most offices had shorthand writers--frequently called stenographers or secretaries (their modern equivalent is much like today's administrative assistants)--who took dictation from the boss and typed up the dictation into letter format. Prior to the 1880s, before the typewriter took the business world by storm, transcription from shorthand was done in longhand. The boss would sign a typed letter if there were no errors and out it would go in the mail. It was a faster process than having the boss draft the letter in longhand or, worse yet, try to type it himself. After all, typing--what we now call keyboarding--was a skill that bosses simply didn't possess. They were too busy doing "boss" things. 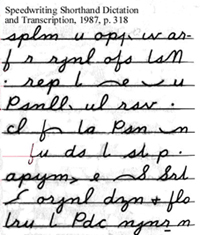 Pen stenography in the United States today is used as a personal tool for notes and only occasionally as a business tool. Of course, shorthand remains an important part of our legal system, but there are few if any pen writers left who have enough speed. Depositions and court work rely on the shorthand machine, a tool which permits the rapid recording of speech plus the added advantage of computer-aided transcription. In Great Britain, reporters are required to take shorthand and pass shorthand tests; I have also heard that pen stenography is still in demand for use in offices. Judging by the number of inquiries I get from India, shorthand seems to be alive and well there, too. But shorthand, especially pen shorthand, is not dead by any means. True, it is not experiencing the glory days it had in the past; however, there are thousands or millions those who still use it for employment purposes, who use personal shorthand to make their lives easier and more productive, or who enjoy it as a hobby. This site is devoted to all those people who find shorthand a means of communication, an indispensable business or personal tool for making records and notes, and for those of us who are fascinated by it and enjoy it for no other reason. If you're interested in learning shorthand, here's what you need to know. 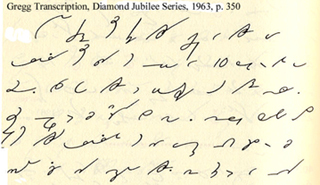 Compare shorthand writing against tape recordings. A brief description of modern shorthand systems. Gregg Shorthand has evolved into several versions. Here's why. Gregg writers can find out which version of Gregg Shorthand they write. Want to write faster? Here are some suggestions. Find dictated material at 60, 80, 100, 120, and 140 w.p.m. from old shorthand texts on various subjects. This section is updated monthly to keep you in practice. Information about me, your web host. The views expressed on this website are completely my own. Feel free to ignore them or disagree with them. Site last updated April 1, 2019. Site originally created and launched in 1999.